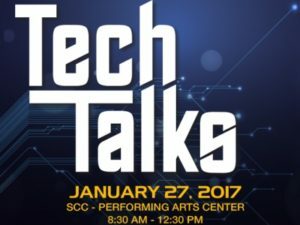 Speakers at Scottsdale Community College’s Tech Talks 2017 will share stories, ideas and insights about how technology and education, when combined, have the power to chart successful outcomes for students. The January 27 event, patterned after the acclaimed Ted Talks, will start at 8:30AM at Scottsdale Community College‘s Performing Arts Center located at 9000 E. Chaparral Road. The last presentation is scheduled to end at 12:30 p.m. Topics will include Putting the Person Back into Personalized Learning and Implementing a Virtual Reality Classroom. The event is free to those who register in advance here.